President Harry S. Truman and Secretary of State George C. Marshall shake hands as the chief executive sees Marshall off on the secretary’s way to the London Conference of Foreign Ministers on 20 November 1947. Marshall had given his Harvard commencement speech advocating aid for Europe five months previously and Truman would sign the bill creating the Marshall Plan five months later. President Harry S. Truman signed the Economic Recovery Act on this date in 1948. Better known as the Marshall Plan after the Secretary of State who helped bring it to fruition, the initiative was one of the great successes of the Cold War. In April 1948 Europe was entering its fourth spring of peace, such as peace was; if you were living in Italy, Greece, Eastern Europe, or many other locales at the time you might have seen things differently. The most immediate crisis after V-E Day was relocating displaced persons and feeding the starving. 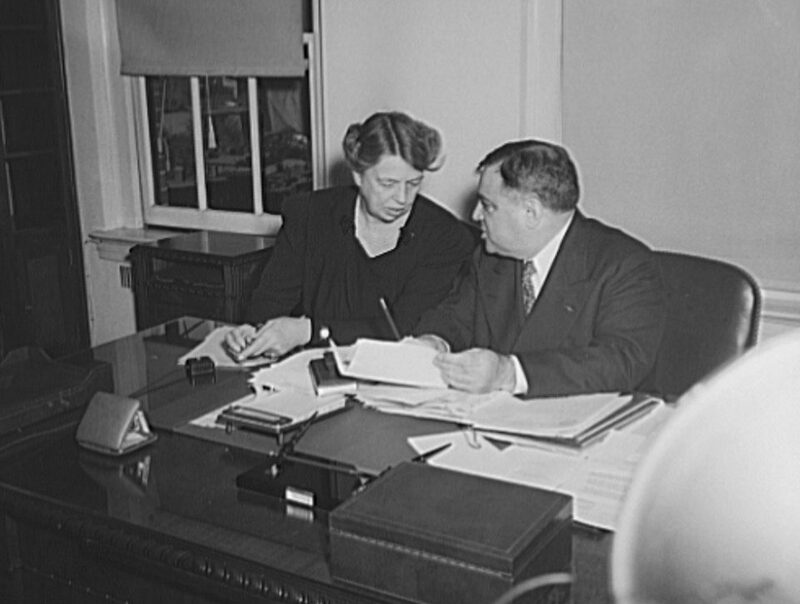 Much of the latter task fell to Fiorello H. La Guardia, the former mayor of New York City who took the job of Director General of the United Nations Relief and Rehabilitation Administration (UNRRA) in spring 1946 and worked his characteristically indefatigable schedule for nine brutal months until resigning in poor health and passing on in September 1947. Great as the work of La Guardia and his staff of almost 25,000 workers was, it was apparent that their endeavors were insufficient on their own and that a longer term strategy was necessary. On 5 June 1947, now two full years after the war’s end, Secretary of State George Marshall gave the Harvard University commencement address in which he laid out the case for an assistance plan to aid Europe. He called for a policy not to aid any particular country per se but a policy “against hunger, poverty, desperation, and chaos” more generally. The Soviets themselves could have participated had they wished. Events moved quickly after that, with bipartisan support coming from both houses of Congress. The bill passed 69-17 in the Senate and 329-74 in the House. All that was left was for Truman to sign the measure into law on 3 April 1948. People often take initiatives such as the Marshall Plan for granted, in large part because they were conceived so well and executed so efficiently that we take their benefits for granted. Men like Truman, Marshall, Dean Acheson, and the late Franklin Roosevelt understood the mistakes of the First World War. They had seen the Bonus Army in Washington and the rise of Hitler and fascism in Europe. That is why they created such measures as the Servicemen’s Readjustment Act (GI Bill) and Economic Recovery Act (Marshall Plan). We would do well to remember just how difficult it is to execute good policy. It is extraordinarily difficult to solve problems well, and all too easy to undo good diplomacy through arrogance, carelessness, and ignorance. Yesterday morning at work I was going through some boxes of archival images for a presentation tomorrow when I came across these two. These are students at what is now New York City College of Technology in about 1950, when the institution was still known by its original name, the New York State Institute of Applied Arts and Sciences. There was–and still is–a strong veteran presence on campus because we began as a GI Bill school just after the Second World War. This fall I intend to get back to a project about the early years of our college, with a special emphasis on our founder: Benjamin Harrison Namm. I had intended to do it over the summer but the revisions on the latest draft of my Civil War manuscript took longer than I expected. Namm had been a major in the First World War and returned to run the department store his father founded in Downtown Brooklyn, which he took to new heights. When the Second World War was winding down Namm understood that returning GIs needed the educational benefits and other services not afforded the doughboys of 1917-18 and became determined to do something about it. There was to be no Bonus Army this time around. I’ll leave it at that for now. The dental image is notable because the United States Air Force was one of the leaders in Restorative Dentistry. It was City Tech’s founding provenance that presumably led to the program landing at the school in the late 1940s and early 1950s. And so it remains today. I’ll have more to say on this in the coming weeks.